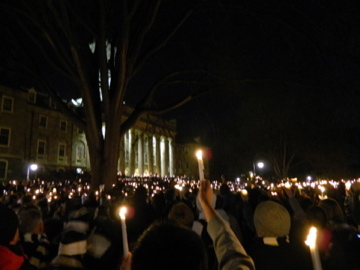 I have just arrived home from the Candle Light Vigil held at Penn State in recognition of the victims of child abuse at the University, and more broadly. I will reflect further on the evening before posting here, but an immediate response to the event that continued to resonate during the walk home was the singing of John Lennon’s Imagine during the ‘service’. While I have flirted with Imagine over the years, the despairing emptiness of the song was brought home tonight. To be clear, I am not pushing some “you have to have religion or nationalism to have meaning” agenda, but you need to try a lot harder than the insipid and vacuous lyrics of Imagine if you want some substantial meaning. Religion (in the abstract) may be full of paradoxes, knots and apparent contradictions, but at least it is full of something. Lennon’s Imagine is merely a carefully constructed list of platitudes that attempt to mimic depth and gravitas. The sheer hollowness of the lyrics was driven into my bones like the near freezing wind blowing across the lawn. Apart from the complete detachment from reality, the sentiment promotes empty thinking rather than critical thought. The imaginary of ‘Penn State’ provided the conditions for these abuses to occur and the hubris to attempt to cover them up. The last thing that is needed is imaging. What is needed is mourning, humility, reflection and silence. Not circuses and children’s song about some utopia (literally no-place) where it is always school holiday and ice-cream is served instead of vegetables.